Water levels could fall significantly due to development along the Omo River, the lake’s largest tributary. Lake Turkana, one of the largest desert lakes in the world, is located in Africa’s Rift Valley in northern Kenya. The Omo River, the lake’s largest tributary, provides more than 80 percent of its water inflows and is under increasing stress from hydropower and agricultural development in Ethiopia. Ethiopia is constructing a series of massive dams on the Omo that are known as the Gilgel Gibe Cascade, which will provide 4,506 megawatts of hydropower capacity when completed. The 1,870-megawatt Gilgel Gibe III Dam is nearly complete and will also make it possible to divert Omo River water for irrigating sugar plantations in the basin. The land that is slated for conversion into sugar plantations is shown on the map below in pink. These diversions could reduce the depth of Lake Turkana by as much as 20 meters (65 feet), according to a white paper from the University of Oxford’s African Studies Centre. As of now, the average depth of the lake is 30 meters (98 feet). 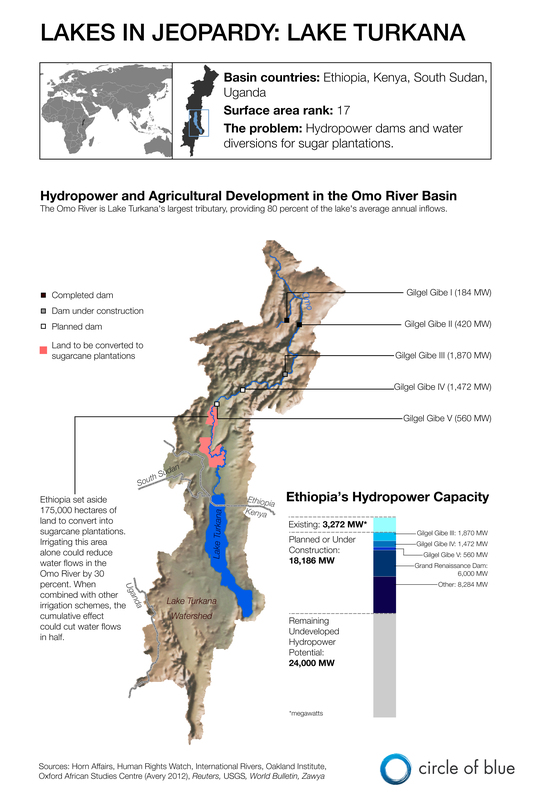 Still, the Gilgel Gibe Cascade represents just a fraction of Ethiopia’s estimated hydropower potential, shown in the chart below. The country’s current hydropower capacity is 3,272 megawatts, while dams capable of producing another 18,186 megawatts are planned or are under construction. Lake Turkana is suffering from hydropower and agricultural development. Click image to enlarge. This graphic is the third in a five-week series documenting threats to the world’s largest lakes. The first graphic detailed declining water levels in Lake Urmia, and the second explained pollution in Lake Baikal. Click here to read Circle of Blue’s report about endangered lakes and here to view an interactive map of threats to the 20 largest lakes in the world.